Dr. Nancy Highland focuses her practice on offering patients general dentistry and cosmetic dentistry care. In addition to providing preventive care and routine exams for patients of all ages as a general dentist, Dr. Highland is also a skilled cosmetic dentist. She offers a range of cosmetic dentistry options, including teeth whitening, the placement of porcelain veneers, tooth colored fillings, and other transformative procedures. She has the skill and experience to combine several cosmetic options for a dramatic transformation, and she can help you design the smile you've always wanted. 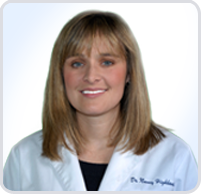 Dr. Highland is a graduate of the University of Michigan School of Dentistry, and she practiced dentistry in Michigan before moving to Memphis in 2005. She is married to Matt and has two children. Dr. Highland is also an avid runner and competes in local and national competitions. Patients love her gentle and kind nature and her focus on high quality dental care. If you would like to schedule an appointment with Dr. Nancy Highland, our cosmetic dentist, contact our practice serving Lakeland and West Tennessee. She has helped many patients improve their lives by enhancing their smiles with a range of cosmetic dentistry options.